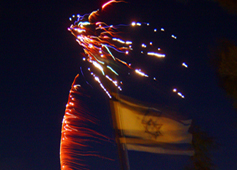 Yom Haatzmaut must be the only festival that the Jewish world doesn’t feel the need to celebrate together. Looked at dispassionately, this is kind of strange. Like it or not, the creation of the State of Israel is pretty big news that continues to resound. After two thousand years of exile, the Jews once again have a country of their own. After two thousand years Jews no longer need live as a minority, need no longer speak a foreign language or live according to a non-Jewish calendar. As the national anthem concludes, we are now a free people in our own land. But the day to mark this transformation is met with ambivalence. Is it because many celebrations tend to remain tacky, old-fashioned, hora-and-felafel-filled embarrassments? Is it because Israel itself hasn’t really developed any deeply meaningful ritual to practice on this day? After all, wafting a piece of cardboard over a barbecue doesn’t quite compare with lighting the Shabbat candles. Or is there a deeper issue? Is it that neither the Diaspora nor Israelis have internalized the significance of Israel for all Jews? Is it that not everyone feels like partying? What is the problem with Yom Ha’atzmaut?